A male Killer Whale does not appear to be bothered by the boat traffic passing by Northern Vancouver Island in British Columbia, Canada. As a male Killer surfaces near a barge, the crew aboard the tug have a good look at this large male whale as the pinkish hues from the sun reflect off his backside. The waves in his dorsal fin are very prominent in this picture as the mist from his blowhole lingers above in the sunset lighting. Boat traffic around Northern Vancouver Island has increased over the years and many of the Killer Whale researchers have studied the effects the boat traffic has on these beautiful marine mammals. Studies have found a different in their behavior and swimming patterns when more boat traffic is present than when there is only one or two boats nearby. The calls amongst the whales seem to be longer in length so their other pod members can hear them when the engine noises of the boat traffic becomes too much. As this barge passes, the male Killer Whale does not seem too disturbed by its presence as the barge slowly makes its way through the passes off Northern Vancouver Island. Guidelines are outlined for whale watching boats, cruiseships and other boat traffic, including pleasure crafts, off Northern Vancouver Island, which should be adhered to if a pod of whales is seen. Some of these guidelines read that any boat traffic should not approach closer than 100 meters to the whales and your motor should be in neutral or idle. When leaving the whales, leave slowly and do not increase your speed until you are three hundred meters away from the whales. A list of guidelines is available on the internet for any boats wishing to view the whales off Northern Vancouver Island. 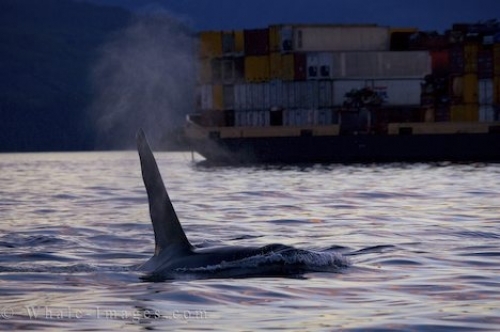 If all the guidelines outlined for boat traffic are followed, the effect on the Killer Whales should be minimal and the future will allow humans to enjoy their beauty off Northern Vancouver Island for years to come.